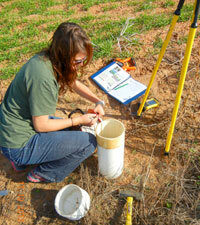 The first step in any hydrologic investigation is characterization of the resource. Initially, upper, lower, and lateral boundaries of the groundwater basin are determined, and then aquifer properties—such as saturated thickness, hydraulic conductivity (ft/day), transmissivity (ft²/day), specific yield, and storage coefficient—are determined to understand the storage and yield capacity of the basin. Groundwater basins are dynamic; aquifers adjust constantly to short-term and long-term changes in climate, groundwater withdrawals, and land uses. Thus, the amount of water entering the basin (recharge) and the amount of water leaving the basin (discharge) are also important factors in the evaluation of groundwater availability. Hydrogeologists use a variety of methods to estimate aquifer parameters, recharge, discharge, and water quality of the basins. These include physical measurements, such as water levels in wells, stream flow measurements, aquifer pumping tests, tracer tests, and water quality sampling. Other methods are indirect such as developing water budgets and utilizing computer groundwater flow models. Computer models enhance our understanding of current conditions as well as assist in the prediction of aquifer response to future climatic or land use changes. Consistent with state law, the OWRB conducts maximum annual yield (MAY) studies to determine amounts of water that may be withdrawn from Oklahoma's groundwater basins by permitted water users. The resulting figure is considered to be the amount of water that can be safely withdrawn from an aquifer to ensure a minimum basin life of 20 years. To arrive at a basin's MAY, investigators map the total land overlying the basin-often divided into sub-basins for yield determinations-and estimate the amount of water in storage. Next, they determine the rate of natural recharge and total discharge, transmissivity, and potential for pollution from natural sources. The balance of the available water is then allocated proportionately to each acre of land overlying the basin. Prior to final consideration of this prorated amount, hearings are held to allow public input to be included into the determinations.